What do you see yourself doing five years from now? This is one of the most common questions people find themselves being asked in job interviews. Sure, some of us have actually thought of things beyond this weekend or even this month, but for most of us, we only have a vague idea such as save enough for a car or an apartment. As a reader of this newspaper, you of course are among the few that have specific ideas and possibly detailed plans to be the vice-president of something or the other, make so much money by year five and have married the man or woman of your dreams. Now for the question that’s a whole lot harder to answer—will you be happy having achieved that and doing the things you reckoned you’d like to be doing? Psychologists have spent a great deal of time thinking about this whole business of happiness. What is it we want as people and do we really know what we want and will we be actually happy when we get what we said we want? This is pertinent not just to us as individuals, but to each of us as employers and managers. In order to comprehend what motivates and drives each of us, despite what we assert and claim, it is well worth paying attention to these psychologists. And it probably doesn’t hurt to comprehend happiness and its meaning in our work and personal lives. Philosophers across cultures and times have put in their share of time, probably a whole lot more than psychologists, pondering on happiness and the meaning of life. However, the work of most philosophers and even psychologists is not always easily comprehensible, even when accessible. Luckily then there are people like Daniel Gilbert, professor of psychology at Harvard University, who write with such great fluidity and incredible wit, that suddenly all is clear. OK, maybe all is not clear, but certainly seems that way. 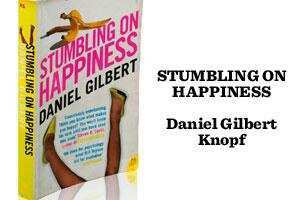 In his book Stumbling on Happiness, Gilbert jumps in feet first to explore (and explain) how the human brain attempts to imagine the future and how it rarely is right. Even when trying to predict the answer to a simple question such as “how much would you enjoy a bowl of spaghetti (or some other favourite food)"—our brains, and therefore we, perform terribly. So you can imagine, if we try to answer business questions, such as what do we see happening to the funding situation for start-ups or will consumers spend more money dining out, we are not likely to perform much better. Does this mean we should not try to get such questions answered, or worse yet, not raise them? The key premise that Gilbert makes is that when answering questions about the future such as “what would make you happy? ", even though we think we know the answers, we are most likely wrong. To his credit, much of his book is devoted to explaining this dissonance between what we think we want and how we actually behave—less than ecstatically—when we have it. Stumbling on Happiness works at the personal level, in understanding ourselves, the ways we (and our brains) fool ourselves and, most importantly, it makes us question fundamental assumptions about what we seek and how happy that will make us. For businesses, it holds powerful lessons in what Gilbert terms as presentism—how the future we envisage is all too often more of the present. When we envision scenarios, we utterly fail to recognize that there are things that we have not visualized, and we are then surprised when such scenarios unfold. Above all, I’d recommend that you run out and grab the book for Gilbert’s laugh-out-loud writing style alone. K. Srikrishna is an entrepreneur and angel investor. He writes about issues that business leaders and managers face and books that could help.